The first time I visited Paris was my first real trip abroad unchaperoned and fully in control of my own destiny. That journey helped start me on the path to who I am today. I have a lot of great memories of that trip. Now I’m back for a few days and I’ll try to find out what’s changed – both here and within myself – and rediscover my younger self in the process. This is part of a series of my reminiscences of Paris. After wandering around a bit I found my old neighborhood. The place I remember from a dozen years ago is still right where I left it. I didn’t consciously start out the night trying to find the place, but as I meandered I suddenly realized that I was really close to where I’d had those experiences. I guess on some level I was searching the place out. When I was prepping for my trip I opened up an old phrasebook (a version of Rick Steves’ French, Italian and German Phrase Book ) and found the name of the hotel written there. Now I had at least one fixed landmark to go by. I didn’t look it up online before I went looking. I didn’t want to spoil the adventure. And I didn’t want to find out that it was closed. But that name was a lucky find because it would let me confirm that I was in the right place if it was still there. So on my last night in Paris I headed out, taking the Metro into town to wander around. When I realized I was close I knew I’d need to try and find it again. I remembered the rough location – on the Left Bank of the Seine just south of Notre Dame cathedral. A couple of streets off the river. But how close to the cathedral? And how many streets over? Who knew. I found a couple of likely areas on Google Maps on my phone. But time can play tricks and make the location seem closer or farther away. Better to start off, I figured, a short distance away and make my way to where I thought the area might be. That also gave me more time to think back to the last time I was here. I reminisced about the events of that New Year’s Millennium’s Eve fondly. I passed a number of places that could be the Irish Pub space, but now occupied but something else. That was the biggest target to spot since it was on a corner and had a large front. So I focused on finding that. After about an hour’s meander I saw it. Lit like a beacon. I walked up to Corcoran’s Irish Pub, not quite willing to believe it was the same place. 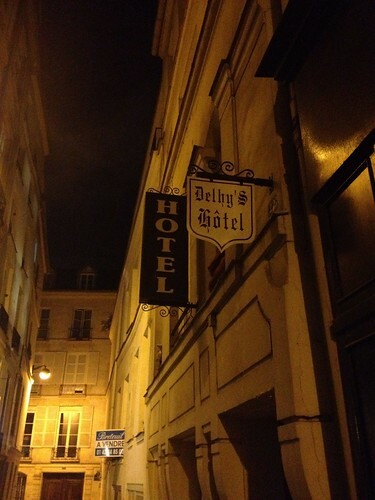 A quick detour down a couple of side streets and I found Delhy’s Hotel. My one confirmed waypoint. I’d found the places I remembered. I darted into the pub for a quick pint of Guinness and to check the place out. It was just like I remembered. Even down to the cover band that played popular music cover songs, in between Beatles classics. The patrons were all expats from some region or another. It was still as rambunctious as I remember, despite the fact this was only a Thursday and not a holiday period. One beer here was enough to realize it was the same. I could have stayed for more and tried to fit back in here as a regular. But I had changed enough that I didn’t really care to. I had one more mission in tracking down my memories. That was the 3 fromages sandwich. This sandwich was a staple of our diet a dozen years ago. 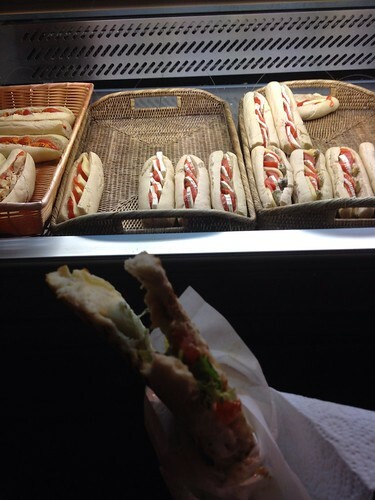 Cheap and tasty, the sandwich was made with a baguette split down the middle. Mozzarella, bleu and a third mystery cheese piled thick, with tomatoes inside. Once the sandwich was pressed panini style the cheese became a hot, dry, satisfying taste, with the tomato a juicy complement. The sandwich place was still there and still open, the sandwiches still tasted the same and the price was only just a bit more. For my next visit I’ll try and identify the mysterious third cheese. My foray into the past completed, I headed back to the hotel. Satisfied and bathed in nostalgia I slept happily. But Paris wasn’t through with me yet. She still had one more story to give me. That will wait for the next post. 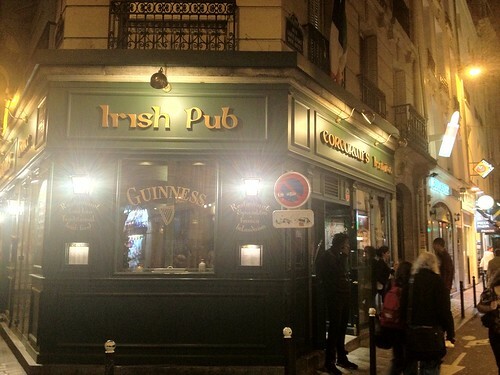 Posted on September 10, 2012, in Europe, Paris: A Reminiscence and tagged 3 formages, corcoran's irish pub, delhy's hotel, Europe, france, paris, reminiscence, travel. Bookmark the permalink. 1 Comment.